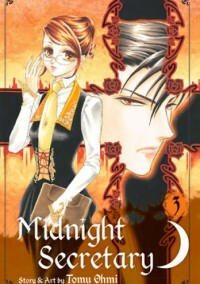 In this volume of Midnight Secretary, Kaya is having trouble managing her time between her reassignment to another office and her time spent as Kyohei’s “special secretary.” She spends her days working hard to get the new office’s secretaries trained, and her nights seeing to Kyohei’s needs. When she catches her new boss’s eye, things begin to go South. What’s great about this volume is that I finally got to see Kyohei struggling with what’s growing between Kaya and him. He’s starting to care for her, but that’s leaving him feeling conflicted. He doesn’t like his dependence on her blood. He certainly doesn’t like feeling jealous when he notices her boss’s interest in her. I think his reactions are a bit overdramatic, but I guess it’s understandable considering he’s always felt independent and even superior to humans. It’s just nice to see him emote. Kaya has let herself fall for Kyohei completely, no matter how much she tries to hide behind it as a job. She likes being his lover, and when she’s deprived of that for a time, she misses it much more than she ever would have anticipated. I’ve read this in other reviews on this series: this is straight up paranormal romance for women. So, if you like paranormal romance and you want to read some manga, this is a good series. There are some definite misogynistic themes, but I’ve found that easy to overlook. Sometimes, it’s all about knowing and understanding what you’re reading.